Hope County, Montana is no-nonsense country, a place where the people are more rugged than the mountains that surround them. Americanism is primarily demonstrated through gun ownership and the natural world can be so aggressive that believing in God is the only way to retain some semblance of sanity. It is the kind of place that, with its misty valleys, expansive canopy of green trees, and diverse wildlife, looks attractive in photos, but in reality will kill without hesitation. 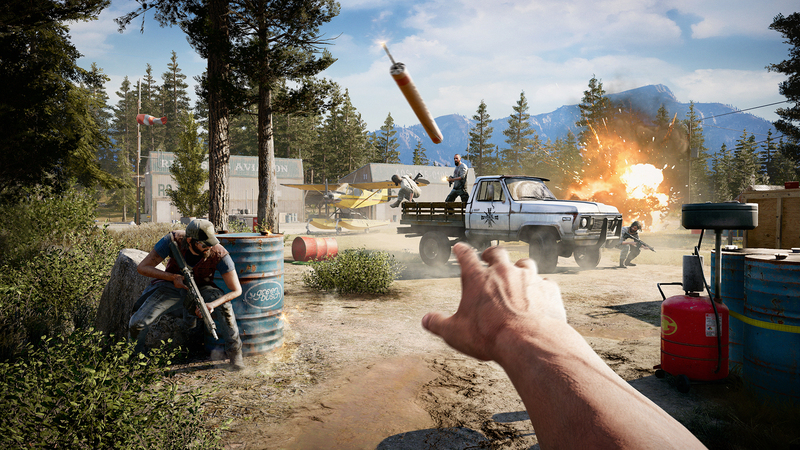 Death by seduction is a core theme in Far Cry 5. 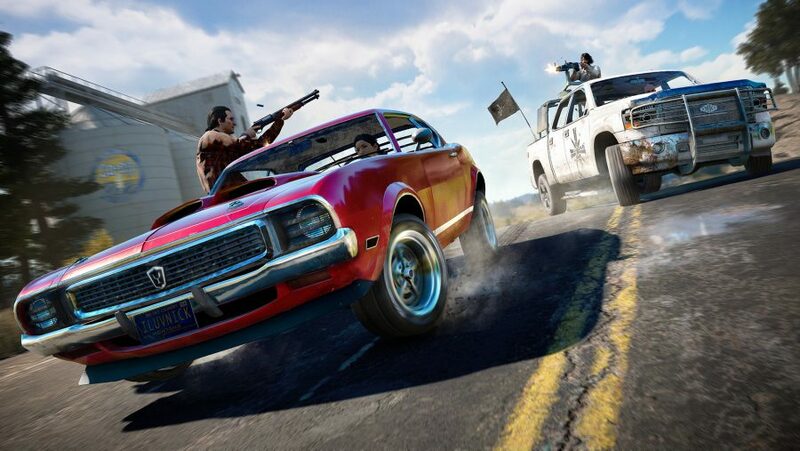 Hope County has been usurped by a heavily-armed religious cult, The Project at Eden’s Gate. It has taken control of almost every inch of grass and every drop of mountain rain, brainwashing the locals into subjugation with promises of a greater existence to come. The idea is seemingly to create its own country that its fanatical leader and Conor McGregor doppelganger, Joseph Seed, can rule over. You can imagine the meeting that spawned the idea: ‘What would an American version of ISIS look like?’. You play as ‘The Deputy’, a shell of a character without any personality whatsoever. With no backstory, no given name, and no genuine link to this world, your job is to stop Joseph Seed and give this land its previous identity back. In the vein of RPGs such as Fallout and Skyrim, the idea here is that you project your own identity onto The Deputy; the experiences gained by blowing everything up, doing favours for the friendlier locals, and surviving fire fights, eventually leading to the creation of a sense of self that is unique to you. The reality of it, however, is that your lack of personality makes you feel like a slave in this world, simply following the orders of whoever happens to be handing out quests at the time. Sure, you can step off of the beaten track whenever you want in a bid to destroy the cult’s infrastructure and kill their members, but you remain a pawn in the system, always lassoed to the grander narrative. Given that you are trying to free Hope County from the grip of a dictator, the irony of such tight perimeters on your progression is palpable. 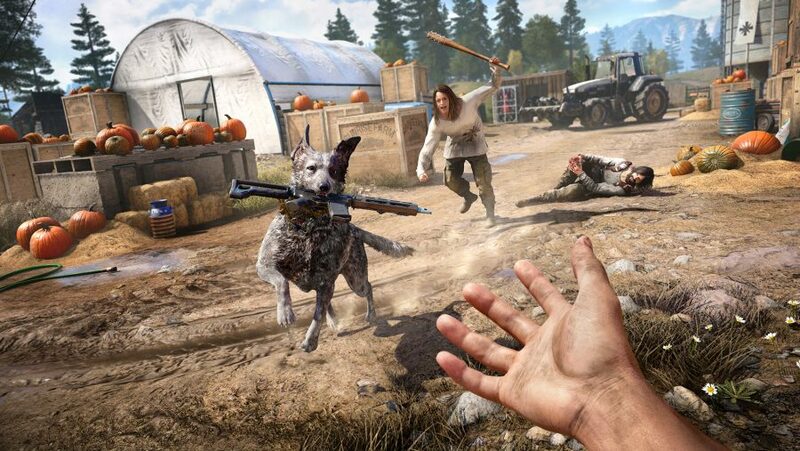 Far Cry 5’s DLC has promised refreshingly diverse settings that take the game far outside Hope County. There are no Peggies on Mars, but that hasn’t stopped Ubisoft from telling a short shooter story there. Then there’s Hours of Darkness: can a focus on stealth see the series make a convincing transition to ‘Nam? The Deputy’s only motivation comes during a prologue scene in which an attempt to arrest Seed results in disaster for your fellow law-enforcement officers. Rather than stay to fight alone, you would think the Deputy might consider trying to get out of the region entirely and sourcing federal support. But, y’know, videogames. Your best bet is to ignore the awkward relationship your own existence has with the narrative and focus on your moment-to-moment concerns. Doing so makes it easier to enjoy the volume of possibilities and outcomes available in this slice of America. While Hope County is kept in lock by its cultist leader, the structure of Far Cry 5 is, at least in comparison to previous games in the series, let loose. 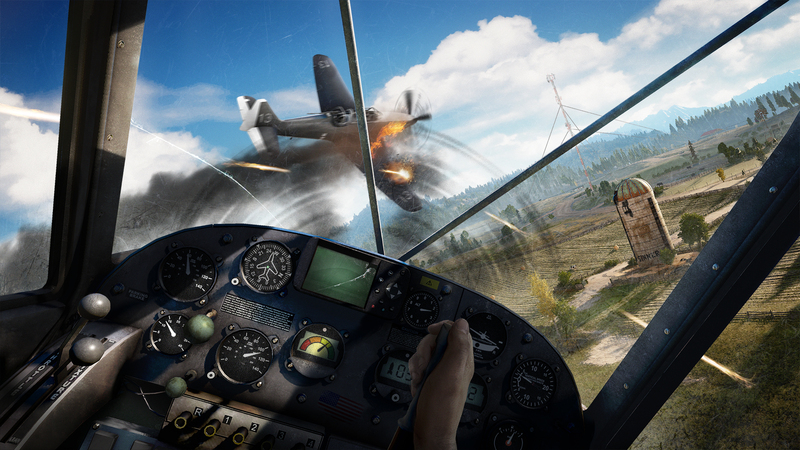 Gone is the need to conquer radio towers as a means of opening up the map and sourcing new quests. It is replaced by the more natural system of navigating to previously unseen areas and chatting with residents in that area who are not under cult control. This change has a marked effect on how you decide to pace your way through the experience, giving you licence to act and feel like a genuine, unhindered explorer in a strange land. Levelling up has also been reworked to be more open and expansive. There are four different skill trees to take your pick from, the opening phases of which require little by way of unlock points to engage with. As such, becoming a jack-of-all-trades is a viable option and a path not to be overlooked in a game that can ask so much of you in terms of combat and evasion. The Renegade tree, for example, focuses on movement and heavy weaponry. If you want access to the parachute and wingsuit, as well as mastery over the game’s biggest guns and explosives, this is where you invest. Assassin comes in at the opposite end of the scale, as it opens up the grappling hook, lock-picking skills, and quieter movement. Prepper skills increase your carrying capacity (not to be ignored) while Survivalist options buff your health, improve your animal hunting proficiency, and make you better at repairing vehicles. These unlocks highlight the range of possible ways in which Far Cry 5 can be interacted with. While the reasons for your actions can feel suffocating and tiresome, the range of approaches available in carrying them out is anything but. An attack on a cultist stronghold can be as straightforward or as grand as you want it to be. Sure, you can roll up in a car, jump out and start firing. You will succeed if you are good enough with a weapon. Clear a location, move on to the next place, rinse and repeat until the credits roll. That will get the job done, for the most part. However, wouldn’t it be more fun to come in from the sky wearing a wingsuit, or spray bullets from above as you fly by in a prop plane? Perhaps you could arm a vehicle with explosives and use it as a runaway bomb. Or consider irritating the local bear population so that it attacks your enemies, giving you the chance to take advantage of the grisly aftermath. This is a game that benefits from being played by a creative mind. It pays to never lose the will to experiment and to continually position yourself outside of your comfort zone. If you are doggedly levelling up just one of the available skill trees, for instance, you are akin to an artist painting a canvas with only a single colour on their brush. With everything Far Cry 5 has on offer, it is a shame that the narrative – and specifically your role in it – feels so distant. 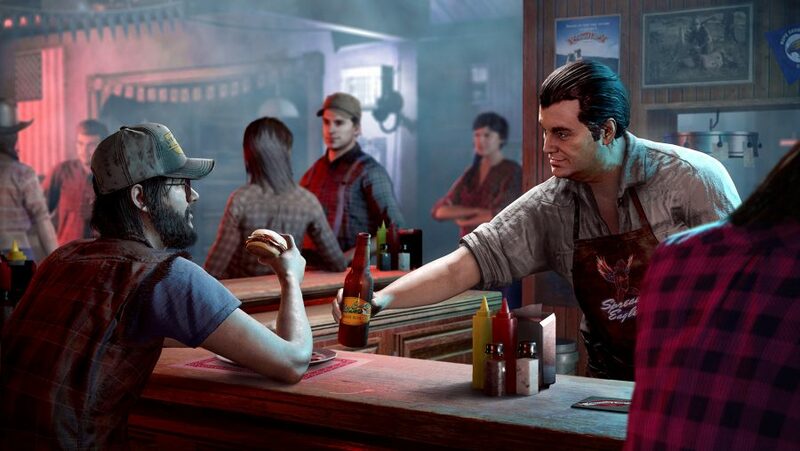 The gameplay and story take place in two different realms due to the emptiness of your character and the lack of connection they have to the world. You might as well be steering a gun that is held in mid-air by two arms floating magically above the ground. Those actions, however, are a joy to engage with and, ultimately, are worth the price of admission alone. This is not a game that makes good on the initial intrigue created by its ‘if what a cult took over?’ plot, but it is one that reminds us just how entertaining it can be to play around in an open world full of interlinking systems.